Roll 1/2 the pastry on floured surface into circle 1 inch larger than inverted 9-inch pie plate. Ease pastry into plate. Combine cornstarch, Equal, cinnamon, nutmeg and salt. Sprinkle over apples in large bowl and toss to coat. 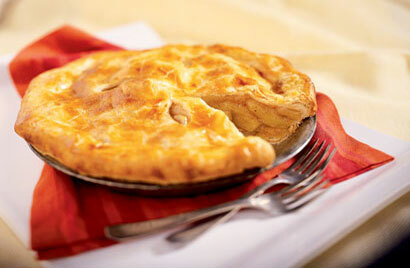 Arrange apples in pie crust. Roll remaining pastry into circle large enough to fit top of pie. Place over apples. Seal edges, trim and flute. Cut a few slits in top of pastry to allow steam to escape. Bake in preheated 400F oven 40 to 50 minutes or until crust is golden and apples are tender. Cool on wire rack. Serve warm or at room temperature. Recipe and image appear courtesy of Equal.